This post has been hacked – missing data will be restored in due course. When holding a meeting or allocating tasks how often do you think – “how much is this meeting/task costing in money”? And if you do “sometimes” or even “always”, are you sure you know the real cost – to compare with the value? Please don’t misunderstand – I realise that money is not the only criterion for any decision – but for these purposes I want to show you one way of working out what I would suggest is the “real cost”. The employee whose job is to provide a service that is charged to customers at an hourly rate. Let’s call her “Sarah”. The employee who makes, designs, invents the product or service that is sold to customers. He’s “Bill”. The employee whose job is to carry out an administrative function. And he is “Jack”. And then we are going to look at the maths to calculate the hourly cost of each of these. Now I should warn you that some of the following may get a bit complicated – and there is no rule against skipping to the category that is most relevant or “suspect” in your own business. Looking into the future, how many hours chargeable work will you have for her? Is it – as many as she can work? Or does it depend on demand? Or perhaps you guess it will be a percentage of her available time – maybe, based on previous experience. It’s your turn now. Which one is it – or do you have another expectation altogether? If we are going to do some maths later this is a key variable that has to be quantified. Now, everyone will need some time for administrative functions: meetings, internal emails, study, scheduling, staff Christmas lunch and all the rest. A second variable here is your estimate (as a percentage) of her total employed time that will be needed for these non-chargeable activities. Absence due to illness is an unknown but the Office for National Statistics tracks the historical information in some detail. The trend is that we are losing less days – but there is a variation depending upon gender, age and occupation. For our purposes we can assume an average of 5 (otherwise) working days a year will be lost. A simple spreadsheet can be prepared along the following lines – here I have one “box” for the variables and a second with the calculations. The direct cost of each hour that earns money for the business is nearly 40% more than the basic “hourly rate” when all holidays, sickness and non-chargeable time has been taken into account. Keeping track of the actual chargeable time is the key to checking these assumptions and provides the information to correct the numbers if appropriate. The purpose of the exercise is to ensure that when fixing the charge rate to customers/clients you have a realistic calculation of the gross profit contribution being generated by Sarah. Regular monitoring of the recovery rate of her charges (which can have a material impact on profitability) is, of course, the other necessary discipline. Bill’s role is essential to the development of the company’s services and products. His time is largely under his own control and his value measured in money is perceived to be based on the success or otherwise of the innovations he designs and are adopted. It could be argued that the number hours he spends doing his job is irrelevant to the value of his time. He thinks about the business on and off all the time. He gets inspiration from new experiences, meeting people – from seeing old and new things and reading a widely. So how do you decide on a KPI (key performance indicator) to judge the effectiveness of this employee? One thing is for certain – in a meeting that he need not attend and to which he adds no value, he represents a cost. That cost can be worked out in much the same way as Jack’s costs (up next). It does not seem unreasonable for an employer to require Jack to maintain a detailed diary of what he does and the creative thoughts and ideas he comes up with – and for this to be made available for review on a frequent basis. As most innovation is the development and refinement of existing products and services, the total costs can be monitored against the eventual sales of the “improved” products and services. Jack is a full time administrator. A vital role in most businesses and one that is measured by the effectiveness of the work he does. 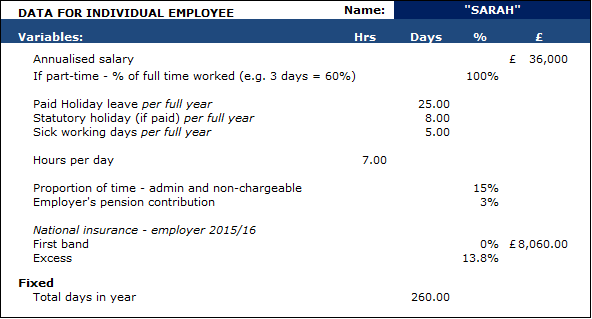 His cost is the hours he actually spends doing the job – and assuming he is on the same salary as Sarah the costings look like this. The calculation of an hourly rate must be for the time actually spent doing the designated job. In addition to salary the function will probably involve rented space and related costs together with specific equipment such as computers and software. The main point of this article is that any time an employee is doing something other than their specific job they may be costing money that could otherwise be saved. Bearing this in mind, it might pay to be super-critical when deciding who attends meetings and asking the question – “is the value to the business and the individual equal to or more than the real cost of them being there?”.